"Man bliver mødt af en herlig legesyge og myriader af spidsfindigheder lige til at gå på opdagelse i." Circuitous, Mountains (1999) 8:56 9,60 kr. 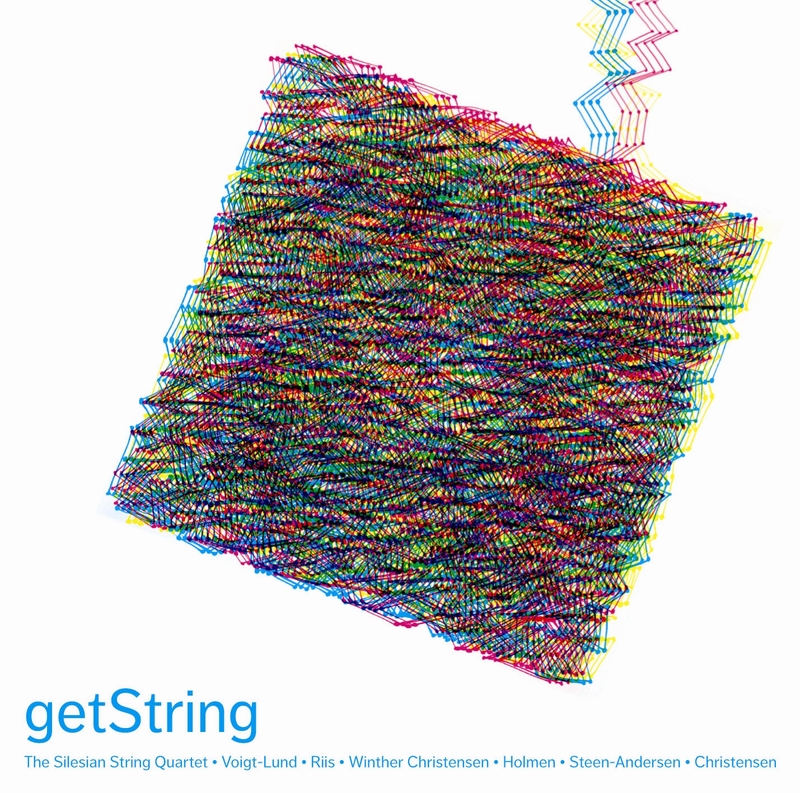 getString (2009) 1:43 6,40 kr. String Quartet (2002-03) 7:06 9,60 kr. fromString (2009) 1:12 6,40 kr. Intend/Ascend (2000/02) 9:14 9,60 kr. useString (2009) 1:21 6,40 kr. String Quartet (1999) 9:38 9,60 kr. toString (2009) 1:34 6,40 kr. Towards Nothingness (2008) 9:16 9,60 kr. quitString (2009) 4:38 6,40 kr. Six striking composers of the generation of the 1970s in Danish music present themselves here with works that in the nature of things must have been composed in their youthful years. Simon Steen-Andersen, the youngest contributor, was just 23 when he wrote his String Quartet. It would thus be banal to point to the ‘youthful freshness' of the music; it would be almost as much of a platitude to refer to their fearlessness in plunging into the classic genre par excellence of chamber music, the string quartet. All the more striking are the inevitability and assurance - at times the virtuosity - that typify the works. This is a generation of composers who, with the music on this CD, demonstrate an effortless mastery of the resources in a clear, well thought-out musical idiom. The music has been painted with a well-controlled but exuberant and colourful palette which gives the overall impression of incredible variation and a wealth of nuances from the blackest black to the loudest bright colours. The quartet Circuitous, Mountains (1999) by Jens Voigt-Lund seductively entices the listener out on the CD's wonderful sonic journey with its introductory ticking and twittering in the brightest register. In his music Voigt-Lund lays out beguiling paths of sound that branch out into a variety of trails and become a vibrant texture that points in many directions. Here one encounters a polyphonic weave spread out by the four instruments and illuminated by small expressive melodic flashes; there the instruments form dizzying, sliding surfaces. And everywhere there are reminiscences of elements already heard. The end just manages to remind the listener of the opening's fondness for the high register before the music ceases in a way that is at once surprising and yet in keeping with the inner, imaginative logic of the piece. The works of Christian Winther Christensen and Simon Steen-Andersen, both with the neutral title String Quartet, are related to Jens Voigt-Lund's in their expression and in the use of a large number of unconventional, more or less noise-coloured instrumental techniques. In this they are indebted - perhaps especially Christian Winther Christensen - to the German composer Helmut Lachenmann (b. 1935), who was a pioneer in this field, not least in his works for strings. The very robust dialectic between noise elements and (the absence of) traditional sonorities, which in Lachenmann's early works emerged as a critical comment on the tradition, has however gradually been superseded by an integration of noise and tone in a more rupture-free musical universe. This can be heard for example in the composer's Third String Quartet, Grido (2001-02), where the dialectic is so to speak embedded in the material itself. And this is clearly where the young Danish composers have taken their point of departure. Christian Winther Christensen's String Quartet (2002-03) thus creates a network of relations, not only between noise and notes, but also between other expressive characters, for example stasis and motion, or points and lines, whispering and violent eruptions. With a point of departure in such fundamental antitheses the music creates its own subtle logic and drive despite its fragmented character. The composer seems to have reached beyond traditional musical syntax and listened his way to meaningful anticipatory models that can involve both fulfilment and suspension. Shortly before the end it is as if the music, in nostalgic retro-spect, touches on the tonality of a bygone time, which must however fossilize and disintegrate under our gaze and make way for the concluding gesture of the work. Extreme is a word that is often applied to Jexper Holmen's music. The twin work Intend/Ascend for amplified and distorted string quartet (and celesta!) is no exception. Here the instruments play in extreme registers at the utmost limit of the possible. The realization of the piece takes on the character of a savage struggle. If I had made the instrumental treatment a little lighter, it would have come to sound both more effective and probably also more intense and energetic. But the price would have been that it would be music set for string quartet instead of a string quartet set to music. As Intend is executed now, the music burns through the surfaces of the instruments,\\ says the composer. In some paradoxical way the music has become one with the medium, but at the same time transcends it by challenging it to the limit of its capacity. And where the Ascend movement wedges its way into the process with its bright celesta chords mixed in with the wild, tonal sounds of the strings, the ecstasy becomes total. If Simon Steen-Andersen were himself to choose a subtitle or an angle of approach to his String Quartet (1999) it would be \\a (guided) tour into sound or the story of a (musical) line\\. The metaphor of the journey is -ob-vious, for the music makes itself heard as an ongoing organic thread of sound that connects eruptions, collisions and explosions. The establishment of a musical causality on the work's own premises, the inevitability of the onward progress of the journey, are clearly things much on the composer's mind. The key to this is the music's energy-states. \\Energy is my real musical material, it is what develops and propagates through various surfaces (playing techniques/textures) - is transformed, concentrated and transcended.\\ The transformation of matter and its various states (solid, liquid, vapour), in various energy states is thus an apt image of this mutable, virtuosic and indomitable music, which both retains its basic identity and is yet never the same. As a contrast to the nervous mobility of Simon Steen-Andersen's String Quartet we have the almost mechanical weight that typifies Simon Christensen's Towards Nothingness (2008). Here we are in a heavy, rock-like, ‘groovy' universe coloured by dense, dark sonorities. Double-stopping, quarter-tone-distorted fifth sounds with scattered, occasional flashes of harmonics dominate the soundscape. Gradually you catch hold of a little third-based melody that soon hypnotically attracts the attention with its insistent repetition. From time to time the music seesaws from the low strings of the instruments up to the high ones, the sound changes (the compass is transposed up a ninth), but the music remains fundamentally the same. The title is lived out in the last passage of the piece, where the material is reduced to a few grating ‘notes' over a reminiscence of the third-melody, plucked on the cello. Clearly the six young composers have absorbed and digested and/or abandoned, perhaps consciously rejected, the crucial experiences of the past thirty years from the European musical scene: whether musical thinking has followed in the tracks of the French-oriented spectral music (Tristan Murail and others) or the German-oriented so-called instrumental ‘musique concrète' (with Helmut Lachenmann as a leading figure) - whether sensual, technically and analytically grounded compositional principles have been pursued or more philosophical, dialectical-linguistic thinking, the path has led to the breakdown of the note as the essential building-block of music, towards a more global way of thinking in timbre and sonority, perhaps best summed up in the concept of ‘the sound' itself. And these lines of development from the European postmodernist avant-garde thus meet up with well established modes of understanding from parts of the experimental rock scene, computer music and other electronic idioms where it is the produced or precisely the unique ‘sound' that is at the centre of attention.